Comfortable administration of cluster devices like one single device - even at networks across locations. 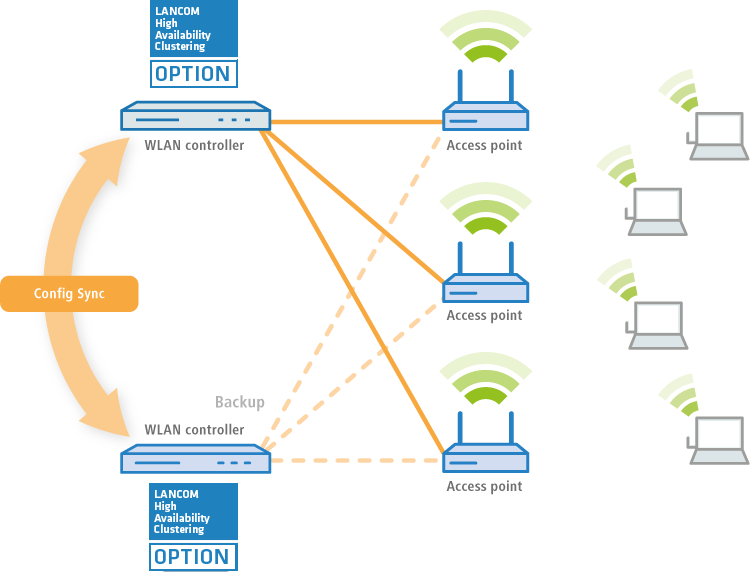 Group several WLAN controllers or central site VPN gateways to a high-availability cluster! 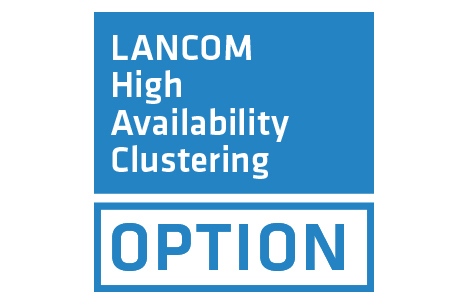 With the LANCOM High Availability Clustering Options you can combine several devices to one cluster. As a consequence, there are many advantages like the central management and convenient configuration alignment (Config Sync) of all cluster devices. This is particularly beneficial for setting up intelligent backup scenarios since only one WLAN controller or central site VPN gateway has to be configured – an enormous time saver for administrators. Furthermore, you benefit from an automatic load balancing and the enrollment of cluster certificates. This software option allows multiple WLCs to be grouped into a highly-available cluster. In this way, configuration changes, features and enhancements made on one WLC are automatically transferred between the other WLCs in the cluster, without having to make manual changes on each individual device. Common parameters in a cluster (e.g. WLAN profiles or AP tables) remain synchronized, individual parameters (such as the IP address of the WLC) are not exchanged. This option allows multiple central-site VPN gateways to be grouped into a cluster. In this way, configuration changes, features and enhancements made on one central-site VPN gateway are automatically transferred between the cluster devices, without having to make manual changes on each individual device. Common parameters in a cluster (e.g. VPN user database, firewall) remain synchronized, individual parameters (such as the IP address) are not exchanged.